As someone who is gluten intolerant and is not very tolerant of many other foods, when I heard Eat Naked was opening in East Street Arcade I was really excited about it and very keen to head down. 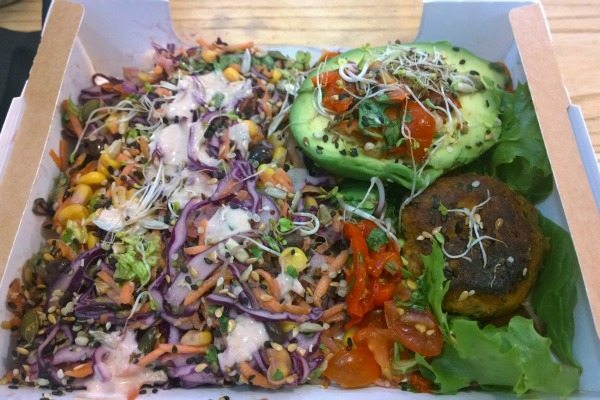 Owned by Stacie Stewart, previous Masterchef Finalist, TV presenter, baker, author and DJ, Eat Naked serves only whole foods in the form of grab and go breakfasts, lunches, treats or juices that are all free from refined sugar, gluten and mostly dairy, using organic, whole ingredients packed with nutrients for a healthy meal. Unfortunately for me, I work on the other side of town, and I’m not often skipping at the thought of heading into Brighton centre on a Saturday as I don’t like the crowds. So it wasn’t until I was showing my friends round Brighton one sunny weekend that I realised I was nearby, hungry and I had to try it out. At the moment they are not open Sundays, although when I was there Stacie mentioned they might start opening Sunday’s soon which is very exciting news. Tucked away in the pretty little East Street Arcade, away from the hustle and bustle (which I enjoyed), Eat Naked has a lovely wee shop complete with a large glass cabinet packed with colourful salads and high protein treats. There is a small bar at the front window with a couple of stools should you wish to eat inside, and a fridge to your right packed with refreshing beverages – of course there are no added sugar in these. 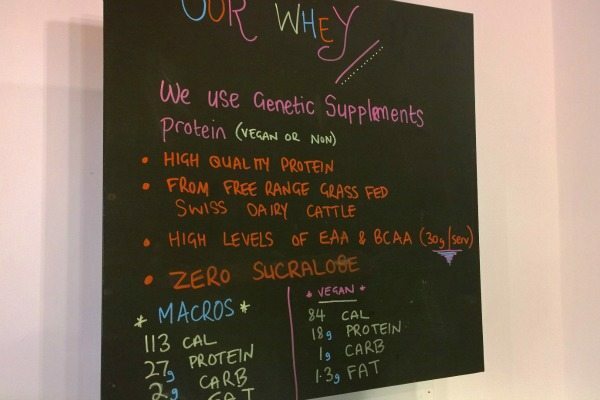 Mounted on the wall is a sign explaining how it works – you choose one main – either organic, free range chicken breast, organic grass feed beef, salmon or the veggie option; then you choose your base of either, rocket, spinach or brown rice; followed by your choice of 2 of the supercharged, nutrient dense salads of the day; topped with your pick of dip or sauce. 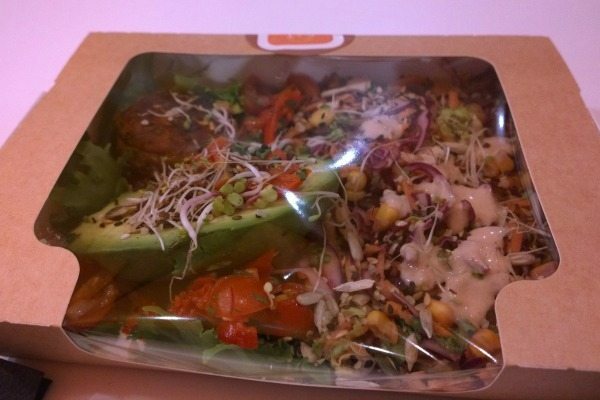 Stacie prepares her salads fresh daily herself, so these change regularly. If you follow Eat Naked on Instagram or Twitter liked I do, you will see these are updated every morning before opening so you can decide what you want even before you arrive. The best thing about it? EVERYTHING is gluten free! 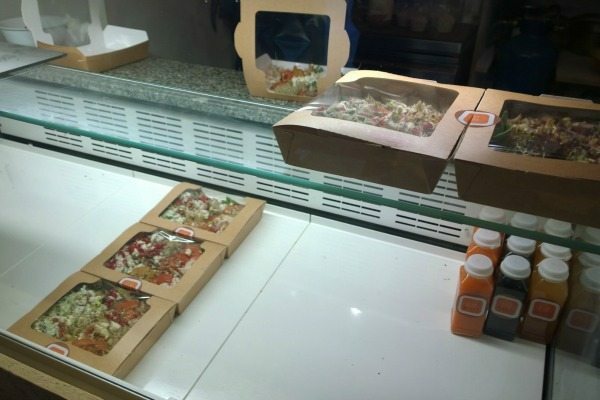 As I was visiting on a Saturday, the standard weekly concept was not in place, as Stacie is now offering ready made lunch boxes (for only £5 or £6 each), with a choice of two so it is easier to manage the weekend rush. I arrived just before 2pm and due to a busy day already, there was only one of one option left and 3 of the other! 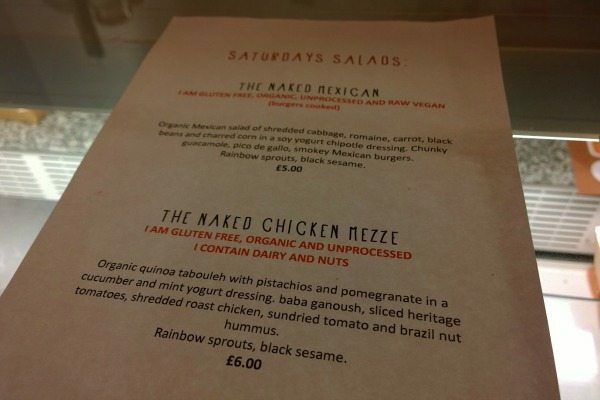 The menu of the day was printed and placed on the counter, and included either ‘The Naked Mexican’ (£5) – an organic Mexican salad with vegetarian Mexican burgers, shredded cabbage, charred corn, black beans, and a soy yoghurt chipotle dressing; or ‘The Naked Chicken Mezze'(£6) containing organic quinoa tabuouleh in a pistachio, pomegranate and cucumber dressing, shredded roast chicken, sundried tomatoes and a brazil nut hummus. I decided to go for the first option as there was only one left and I love the freshness and spiciness of Mexican style food. 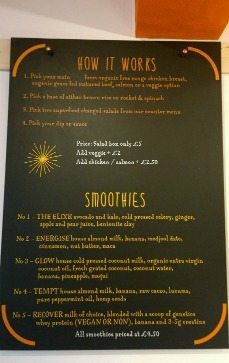 I realised I also needed to get a drink and my eyes steered towards the smoothie menu on the wall. They all sounded great so I asked the guy serving me which was his favourite. This happened to be the ‘Tempt’ which my eye had flickered over a few times, so I agreed and Stacie started preparing one for me. There are 5 to choose from, all £4.50 and containing healthy supplements or enriching ingredients such as ‘bentonite clay’ – known to help your body rid of toxins, or ‘maca’ – a Peruvian root ground into a powder known to balance hormones and give you bursts of energy. 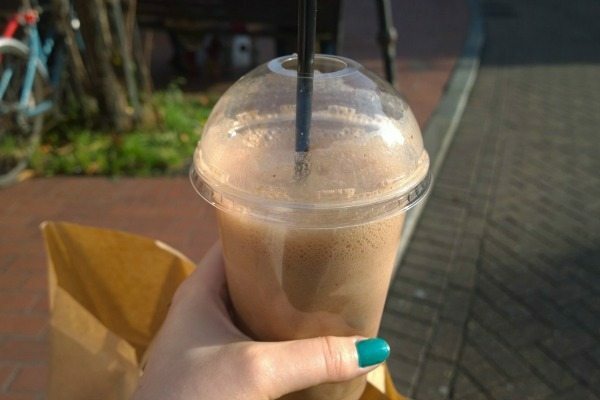 The Tempt smoothie contained pretty much all of my favourite things – almond milk, banana, raw cacao, lucuma (high in potassium, iron and zinc and works as a natural sweetener with a lovely caramel-like taste), pure peppermint oil and hemp seeds (high in amino acids and fibre). It was thick and really well balanced, with a lovely kick from the peppermint oil which I liked. Stacie asked how much peppermint oil I wanted, as it is meant to be there to taste, although if you don’t like the flavour so much then you are able to ask for less. It tasted almost peanutty, and I loved the face that the almond milk was homemade. I guzzled it down quickly (only allowing my friends to try only small sips each) as it was incredibly more-ish and delicious, and not bad for me?! I would say it would be perfect post work out drink as it was very filling and high in protein too. 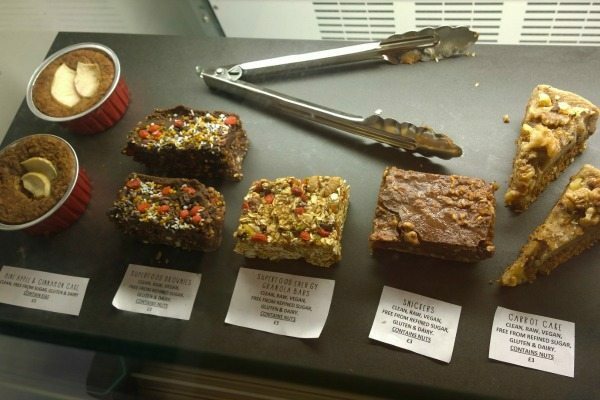 I knew I was going to be full but I couldn’t take my eyes off the sweet treats in the cabinet, as I spotted a ‘Snickers’ slice which had been tempting me on social media since they opened. Made completely raw, vegan, free from refined sugar, gluten and dairy I was super intrigued how they could taste so similar! It was uncanny. 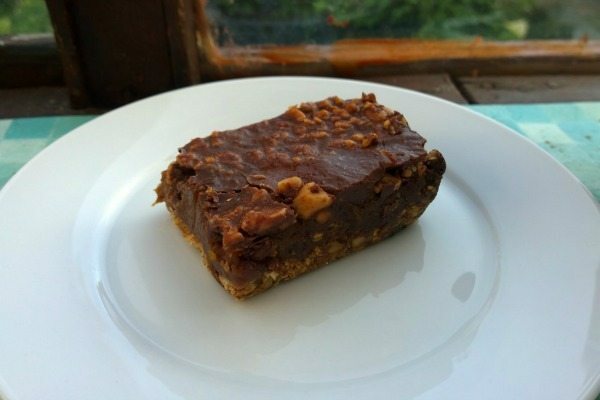 There was a layer of nuts on the bottom, a goey ‘caramel’ centre with what I would guess is dates, and a raw cacoa and virgin coconut oil topping. As expected, this is one of their best sellers, and is an absolute bargain at £3 when you consider the quality of ingredients that is in it. I need more of these in my life to replace the highly processed chocolate tempters brought out at work! 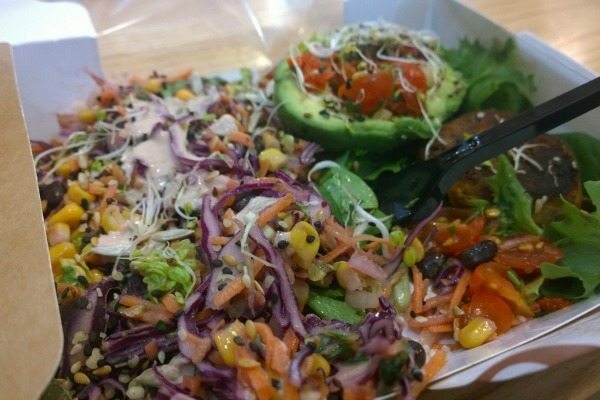 I took my salad away as the stools in the shop were full and we were about to head back home anyway. It kept well on the journey and looked so vibrant, I couldn’t wait to tuck in. The salad was well dressed, and so full of flavour, I loved the crunchiness of the cabbage and the soft pops of the charred corn. The dressing was nicely spiced and gave it a really good kick, but was balanced out by the creaminess of the soy yoghurt. The ‘chunky guacamole’ came as a halved avocado topped with pico de gallo salsa, and the Mexican burgers were lightly grilled until crispy and were a good size – not too big as the avocado is filling. I really couldn’t fault the flavours, everything sang at the right note and I couldn’t stop eating it! 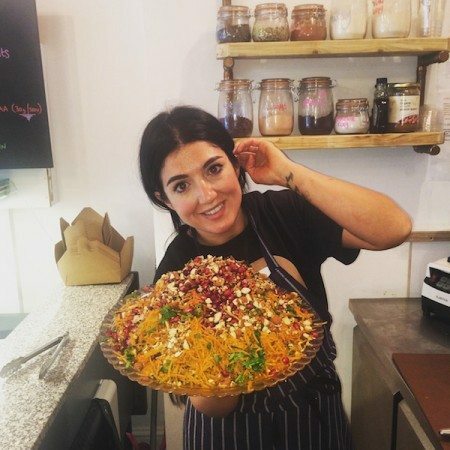 I found the experience at Eat Naked really inspiring, as it proved eating healthy and gluten free doesn’t have to be boring, it is actually exciting and there is so much you can do with a few ingredients and high quality food. I really do need to get on my bike one lunch in the week, and I know that when they start opening Sundays I will certainly be back again to try it out. Also, it’s great as someone who is gluten intolerant to know that I can order anything on the menu and not have to worry about ever missing out!